In the late 1960s and 1970s major government regulations and local efforts to reduce pollution began. In 1972 the Inco Superstack was built to address the air quality and air pollution problems in Sudbury. The 1970s also saw the beginning of a regreening program to rehabilitate barren land and improve the image of the city. This regreening program has resulted in over nine million trees being planted. Before trees could even start to be planted the soil toxicity problem in Sudbury needed to be addressed. The barren soil needed to be treated to counteract substantial soil acidity and metal toxicity. After investigation it was discovered that applying limestone to the impact soil would allow for recovery and reforestation to occur, so between 1978 and 2011 3,435 hectares of land were limed. In recent years the regreening process has shifted to focus on fostering biodiversity in the reclaimed lands with the aim of establishing natural and sustainable forest areas. Despite this substantial progress 35 thousand hectares within the industrial impact zone have yet to be addressed. Additionally, the area around Baby Lake is intentionally not being included in the regreening process. This area will serve as a reminder of the industrial impact on the landscape and as an example of how Sudbury looked prior to regreening. What impact has regreening had on the Sudbury community? The obvious answer is that regreening has improved the environmental conditions in the area, air quality has significantly improved and landscapes are returning to their natural state. Regreening has also contributed to a number of socio-economic factors including a greater sense of pride in community, increased tourism and creation of direct and indirect employment. Sudbury has also become recognized as an international example of a successful regreening project and the city’s approach has been used as a template for dealing with environmental degradation in other cities. The journey to a landscape that has been completely revitalized is still a long way off, but Sudbury has made considerable inroads in addressing a landscape that has been devastated by industrial environmental impacts. The process of rehabilitating industrial scale barren land is a great example of a city taking pride in its natural landscape, even if that means acknowledging a legacy of environmental harm. [i] Winterhalder, Keith. “Environmental degradation and rehabilitation of the landscape around Sudbury, a major mining and smelting area.” Environmental Reviews 4, no. 3 (1996): 185-224. 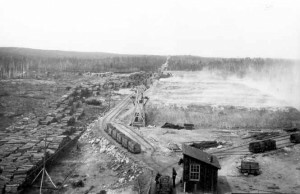 [ii] Gunn, John M. “Restoring the Smelter Damaged Landscape near Sudbury, Canada.” Restoration & Management Notes 14, no. 2 (1996): 129-136. I like the focus of this post and emphasizing the impressive regeneration efforts. The current landscape is unique with its small birch trees and outcroppings of black rock. It keeps changing as the trees grow and enough shade develops for other species. However, I am always struck with pictures before 1970 that I don’t recognize the landscape at all. I also like your reminding us that the current presence of fish (and edible ones) is the result of the substantial efforts of people like John Gunn to rehabilitate lakes. Krista, thanks for drawing our attention north. Despite the hugely successful regreening efforts that have occurred, I think we must still bear in mind that there are long-standing issues remaining, especially in regards to Sudburians’ health. Sudbury has some of the highest incidents of asthma and certain cancers in the world and this is also a remnant of this place’s industrial past. Thank you David and Stacey for your comments. David — I have similar experience when looking at photographs of Sudbury pre-1970, its heartening to see a city which has done so much to repair it’s landscape. Stacey — Thank you for pointing out some of the health impacts associated with an industrial landscape. The legacy of a strong industrial past and present is still being felt on many levels (environmental, economical, social, etc.) in Sudbury. As a former Sudbury resident, I was really interested in this post. There is a lot of debate about why some cities have thrived in the knowledge-based economy (e.g., Seattle and Waterloo, Ontario) while others (Cleveland, Ohio and Hamilton, Ontario) have not. I think that some people, especially my friends on the right of the political spectrum, sometimes forget that a clean environment can help cities and regions to attract companies and talented people. Obviously, there are many factors that are completely beyond the control of the government, but cleaning up historic pollution is a something that municipal leaders can do to boost their community’s chances of succeeding in the global economy. I’ve recently spent some time reading now-discredited predictions about the rise of particular countries and cities and companies. I would, therefore, hesitate to venture a prediction about the long-term economic prospects of Sudbury or any other city. However, I think that the city will do just fine once nickel mining is no longer commercially viable. Thanks the re-greening work of the last few decades, Sudbury is now a credible tourist destination. When viewed from the air in the summer, Sudbury appears like a paradise: blue lakes, winding roads, and lush green forests. There are amazing year-round recreational opportunities within the city limits. (You can go skiing on the university campus!) If Sudbury enacts the right package of policies, it could succeed in attracting computer software companies and other knowledge-intensive firms. Whether or not it currently has political leadership capable of overseeing this transition is, however, an open question. Thanks for your comment. I believe the 1750s date came from Greater Sudbury’s re-greening program timeline (http://www.greatersudbury.ca/living/environmental-initiatives/regreening-program/timeline/). Though a number of scholars suggest that the discovery of nickel was much later, around the 1880s which coincides the blasting done for the CPR in 1883 that discovered large nickel deposits and the establishment of the mining industry in Sudbury. My family drove through Sudbury in 1967. We were traveling from visiting Montreal’s Expo 67 to Michigan’s upper peninsula. I marveled at the desolation of the land around Sudbury. It was always in the back of my mind as I developed environmental awareness. 50 years later I traveled through Sudbury again. What a change! I didn’t recognize the place. Whilst there likely remains much left to be done resolving the pollution legacy from a century mining, I have to admire the progress the people of Sudbury have made thus far.